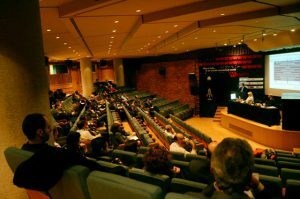 mSensis carried out successfully the “Play it Safe in an Unsafe Connected World” at Goulandris Natural History Museum – GAIA Centre – “Aggelos Goulandris”, Kifissia, Greece, on Thursday November the 13th, 2008. Workshop main objective was to ensure the organizations’ ability to fulfill their mission in the face of a changing risk environment, to communicate them the continuing process in the specific field of interest. Main subject of the workshop was the Effective Implementation of Information Security along with the proposal of Innovative Services and Solutions that will help towards every stage of the Information Security process. The presentations were held by distinguished speakers such as lawyers, security consultants, auditors as well as sales representatives. Delegates of Multinational Organizations attended the workshop while meetings and important contacts were held among highly ranked delegates of the telecommunications area, banking as well as many other public and non-public organizations.